EQUAL EXCHANGE is committed to working directly with co-ops worldwide to bring you the best beans from small-scale farmers. For 30 years, they've created their own path, staying true to their values, even when Fair Trade standards have weakened around us. Equal Exchange believes that, together, we can continue to build a more equitable and sustainable way of bringing delicious coffee to your table, in a way that supports the most vulnerable small-scale farmers. The results are delicious. Dense, velvety, dark, with multi-layered sweetness. Flavors of sweet vanilla custard, caramel and delicate cocoa. Rich, intense brew with chocolate aroma. Intense, with refined citrus-like acidity, full body and firm balance. Complex, with heavy body, hints of vanilla, black pepper, raspberry. Soft vanilla aroma, refined acidity, light, smoky aftertaste. Sweet, sultry, smooth with unexpected bite and lasting finish. Smooth texture, mild acidity, super chocolate-y flavor. Bold, syrupy body and striking acidity. Citrus aroma, caramel flavor, smooth texture & bittersweet finish. Malt-like aroma with sweet, syrupy chocolate flavor. Sweet, dark chocolate, maple, caramel. Creamy texture, smoky finish. Dense, velvety mouthfeel with aroma of cinnamon & molasses. Smooth, soothing aroma, rich irresistible vanilla flavor. Aromatic, nutty, light, with rich hazelnut taste. Rich & full-bodied with mellow acidity & sweet flavor. Easy drinking, with undeniable sparkle and liveliness. Vibrant,with round, syrupy body. You’ll never know that it’s decaf. Coffee, like wine or cheese or chocolate, is a matter of individual taste. The way you handle your coffee is as individual a matter as the bean or blend you prefer. But with ever more coffee connoisseurs refining the enjoyment of this versatile beverage, a few guidelines may be useful. Aroma: Does it smell good to you? The fragrance of coffee is what stimulates your taste buds. Does it evoke butter, flowers, nuts, honey, earth, leather, spice? The smell of coffee, developed by roasting, is liberated by brewing. Body: How does the coffee feel in your mouth? Typically, the "weight" — the body — of a given coffee may be described as light, heavy, rough, thin and so on. Acidity: In coffee, this is a desirable quality, particularly in central American coffees and some from East Africa. (Note that it’s offset by the use of milk or cream.) Without tipping over into sourness, acidity is a matter of taste, balanced in some brews by a touch of bitterness. Roasting is a progressive process, not unlike caramelizing vegetables, that requires temperature and time factors, coupled with the skill and attention of the roaster. Medium: The lightest we offer, suitable for customers who like a bright but less heavy cup of coffee. Some roasters may call this "half city" or "New England." Full City: Slightly darker than medium and adaptable to different foods. 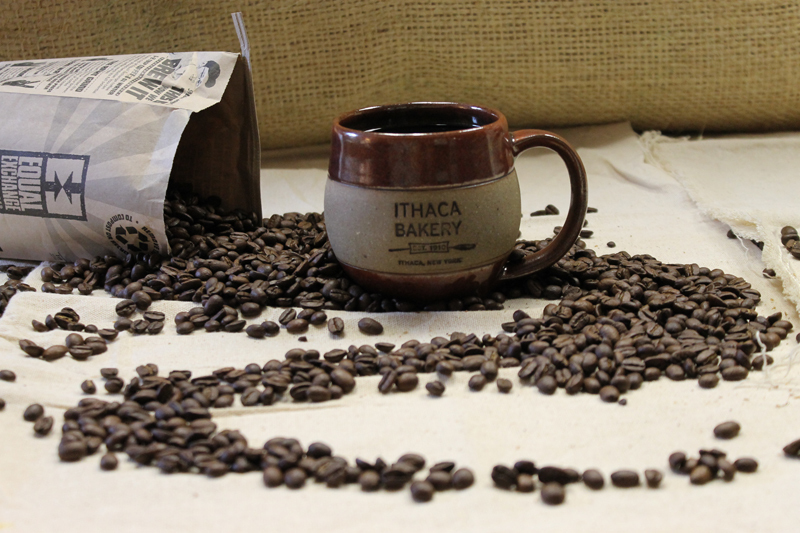 A Full City roast produces beans that are at their most complex and most flavorful." Some may call this "American," "breakfast," or "brown" roast. Vienna: This is darker still than Full City, with the oils of the beans emerging more. The result is a bit spicy, with rich, chocolate-inflected body. Sometimes called "high" or "Continental" roast. French: Our darkest roast. A bold, intense coffee, with bean oils fully emerged, low acidity and full body. The freshest coffee, made with clean-tasting, fresh water, is likely to be the most enjoyable. Start with cold water. The type of grind you choose depends on what brewing system you use. We recommend drip-style, French press or an espresso-maker. Two tablespoons of ground coffee to six ounces of water is a typical ratio, but the strength of coffee you like is a matter of preference. To assure freshness, buy your beans in small quantities and grind only what you will use in a day. At home, store them in an airtight container, out of direct light and in a cool, dry place. While it’s not ideal, fresh-roasted coffee can be stored in the freezer (not the refrigerator) if you take care to make the container as airtight as possible. There’s no need to thaw your beans before grinding, but if they do thaw out, don’t refreeze them. As with wine, a varietal coffee is one made from a single type of bean and named for its country or region of origin. Varietal wines are mostly made with the grapes they’re named for, but the percentage, while high, can vary, by law. Each of our varietal coffees, on the other hand, is 100 percent a single type of bean. Our blended coffees consist of a mix of beans or roasts carefully orchestrated to result in a delicious original coffee. As its name states, our very popular house brew — One World Blend — is such a coffee, concocted of Latin American beans, from Mexico, Nicaragua and Peru. Mind, Body & Soul is another, made of all Mexican beans but incorporating two different roasts. Flavoring is applied to coffee beans right after roasting. Hazelnut is probably the most well-known flavored coffee. The other one we carry is French Vanilla. When you want something a little special, try one of these excellent coffees. Our decaf coffees are processed naturally, using a state-of-the-art method. Semi-liquid carbon dioxide and a small amount of water is applied to the beans so that the caffeine is removed but the flavor remains.